There's plenty to prove on the final weekend of the regular season. Ultiworld’s coverage of the 2018 women’s division is presented by VC Ultimate; all opinions are those of the authors. Please support the brands that make Ultiworld possible and shop at VC Ultimate! The second leg of the Triple Crown Tour is upon us, and 10 teams from across the country1 are set to take the field in New York. It’s also the final weekend of the regular season, with lots still at stake for many of the teams in attendance. Here’s a look at what each team will be playing for over the course of the holiday weekend. No team has more at stake this weekend than does Siege. 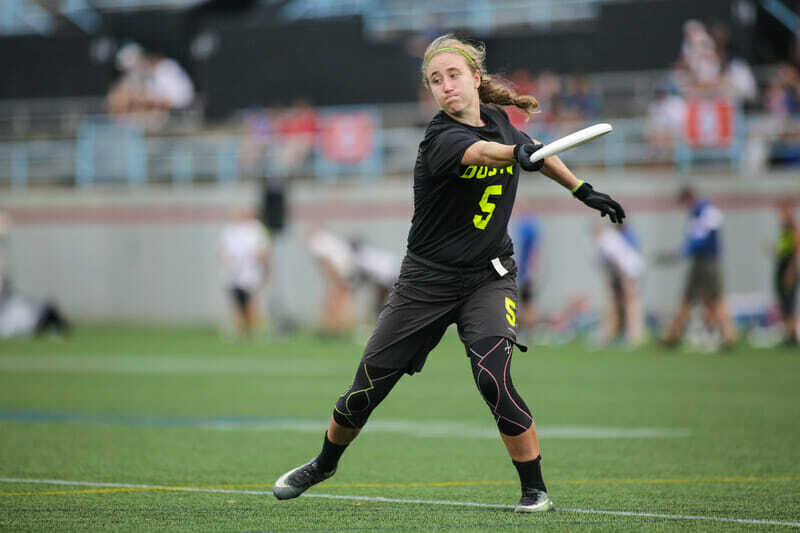 With Quebec Iris short on total games and not competing in the USAU Series, the Northeast is set to have only two bids. Siege currently sits at 19th in the rankings, effectively 18th.2 Siege would have a tough time knocking off Brute Squad or 6ixers at Regionals, so this weekend is likely their last chance to secure an opportunity to go to Nationals. Interestingly, they’re in the same pool as regional foe New York Bent, which provides a significant incentive for collusion in that game; more on that in a bit. But for that game to matter, Siege has to have a strong weekend overall. Pool games against Scandal and Ozone present big opportunities to gain points, but they’ll have to be better than we last saw them at U.S. Open to get the results they need. The task is simple for Heist at Pro Champs: secure a second bid for the North Central. They’re currently sitting at 16th, but are safe by just 14 points. Their Saturday performance at Elite-Select Invite was impressive. They demonstrated considerable handler depth, and Robyn Wiseman was the best player in attendance. But their Sunday results dragged them down outside of the bid cutoff when they began to turn the disc over and Wiseman didn’t look quite like herself. Portland Schwa’s results at the Bay Area Invite have Madison back at 16th for now, but Heist needs to find better day to day consistency, and grab as many positive results as possible to hold onto a bid, lest they have to battle over one bid to Nationals with Minneapolis Pop. For Scandal, this weekend is about improving their performances against the top four. They had an impressive U.S. Open, but were outscored by Brute Squad and San Francisco Fury by a combined 30-8. It’s possible that the gulf between the top teams really is that wide, but Scandal’s 15-10 defeat to Molly Brown in the third place game at U.S. Open indicates they are probably capable of playing those teams closer when it matters. Scandal will, of course, want to upset Ozone like they did to make semis at U.S. Open in the first place, but this weekend will be an opportunity for them to show whether they’re a team the Big Four should fear or if they’re merely in that second tier of teams below them. Pro Champs has to be about finding consistency for Ozone. It’s been a disappointing season for the Atlanta club, especially after their run at Nationals last year hinted at the potential of expanding the Big Four. But rather than the building on that result, inconsistent performances at WUCC and the U.S. Open have us questioning if they’re even the best team in the Southeast. They’ll get a chance in pool play to avenge their upset loss to Scandal at U.S. Open, but a stronger overall performance, from the beginning of the tournament to the end, should be Ozone’s primary focus. This is their last chance to regain the form they’ll need to make another splash in the series. This will be the first time this USAU season we’ll get to see 6ixers at full strength. Well, not including their incoming reinforcement, that is. The last time 6ixers had everyone on hand, they took Brute Squad to double game point in power pools at WUCC. Brute played open lines in that game though, and 6ixers were swiftly dispatched by Riot in quarterfinals two days later. Are 6ixers really a team that can challenge for semis at Nationals? This weekend should provide our first real answer to that question. Without any of the other top four teams in attendance, Boston’s tournament will be about staying healthy and fine tuning ahead of the series. It would be a surprise to see another team from the field win the tournament. Brute Squad’s season could look like a failure if they don’t win a national championship, and this weekend is simply a step on that path for them. For what it’s worth, on top of the chance to secure the no. 1 seed at Nationals, this weekend is an opportunity for Brute to keep their shot at winning the Triple Crown alive, having won the U.S. Open in early August. Grit sit at 23rd in the rankings, but they are only around 90 points shy of the bid cut off at the moment. For frame of reference, they earned 158.49 points from their wins over Underground, Schwa, and Showdown at ESC alone. There’s obviously a step up in the competitive level from ESC to Pro Championships, but Grit played the best ultimate in the club’s history back in Columbus. They’ll need to repeat that feat again this weekend in order to gain a second bid, but at the very least they’re still in the hunt entering this weekend. That in and of itself is one of the more exciting developments of the 2018 club season. Bent are further back from the bid cutoff than Siege, but fancy themselves capable of stealing their bid at Regionals if Siege do earn it. That means Bent will have little incentive to win their pool play matchup, with a strong weekend for Siege being their best possible outcome. It’s a weird situation, but with four Northeast teams in the field, there was bound to be some intra-regional conflict of interest. Neither of these two squads are in the bid picture, ranked 36th and 43rd, respectively. It’s also difficult to see either of them making a serious run at stealing a bid come Regionals. FAB and Hot Metal can potentially play spoiler this weekend, though, and affect some of the seasons of those teams on the fringes. It should also be a good experience for the future of the two clubs to play at a tournament as competitive as this one. Comments on "Pro Championships 2018: Tournament Preview (Women’s)"